Abies beshanzuensis, as described in 1976 by Wu Ming Hsiang in Acta Phytotaxonomica Sinica, 14 edition, is commonly known as 百山祖冷杉 (Bǎi shān zǔ lěngshān / Baishanzu fir) in the Chinese language; as well as Baishan fir to English speakers. There are two recognized varieties. A. beshanzuensis var. beshanzuensis, the typical variety which is described here. A. beshanzuensis var. ziyuanensis (L. K. Fu & S. L. Mo) 1980. Please refer to this link for description and pictures. Description. Baishan fir is a species of evergreen coniferous tree growing to 50 feet (15 m) tall, with a broad conic crown and a trunk up to 2 feet (0.8 m) in diameter. The shoots are stout, pale yellow-brown, hairless or slightly hairy. Leaves are linear, measuring 0.5 to 1.5 inches (1.5 – 4 cm) long and 0.1 to 0.14 inch (2.5 – 3.5) mm wide, colored glossy green above, and with two white stomatal bands below. 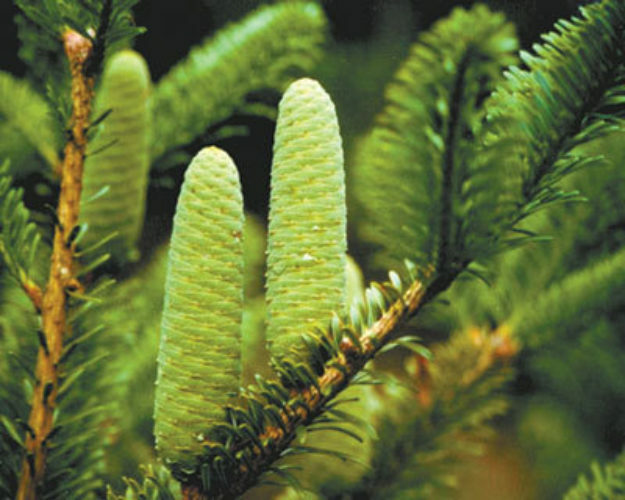 Seed cones are narrowly cylindric-conic shaped, bright green in color when immature, ripening to pale yellow-brown, and measure 2.5 to 5 inches (6 – 12 cm) long and 1 to 1.5 inches (3 – 4 cm) wide, with exserted and reflexed bracts. It is closely related to Abies firma from southern Japan, placed with it as the only two members of Abies subsection Firmae. The species Abies ziyuanensis is included in Abies beshanzuensis as a variety by some botanists, though others place this species in a different subsection of the genus, Abies subsection Holophyllae. Distribution. This species is native to Baishanzu Shan in southern Zhejiang province in eastern China, growing at elevations of 6,070 feet (1,850m) above sea level and is threatened by collection and climate change. The site is within the Fengyangshan – Baishanzu National Nature Reserve. Abies beshanzuensis is classified as critically endangered by the IUCN Red List. It was discovered in 1963 on the summit of Baishanzu Shan (5,942 feet / 1,857 m), where only seven trees were found. Three of these were dug up and moved to Beijing Botanical Garden, where they died. 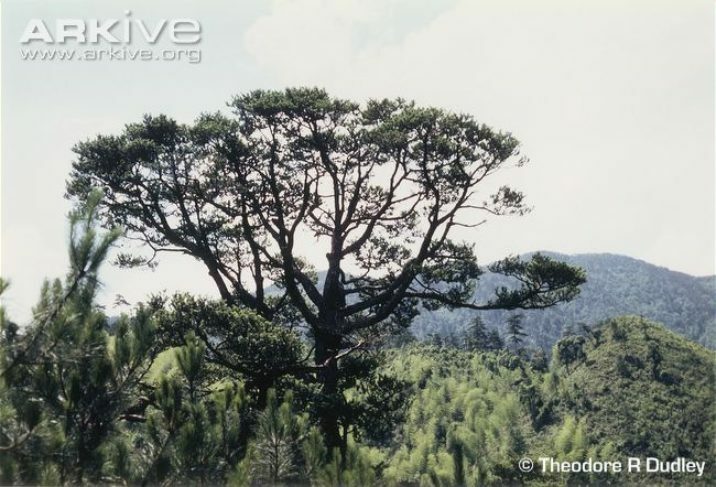 By 1987, only three trees were left in the wild, making it the rarest conifer in the world. New planting of grafted plants on Baishanzu Shan and other nearby sites has shown some success, but the species remains critically endangered. Hardy to USDA Zone 6 — cold hardiness limit between -10° and 0°F (-23.2° and -17.8°C). Attribution from: Aljos Farjon; Pinaceae. Drawings and Descriptions of the Genera; ©1990, Koeltz Scientific Books. Abies beshanzuensis at Baishanzu National Nature Preserve, China. Abies beshanzuensis — a mature-tree in habitat.